As we already know you cannot simply take a component from one car, tack it onto another and expect it to work. 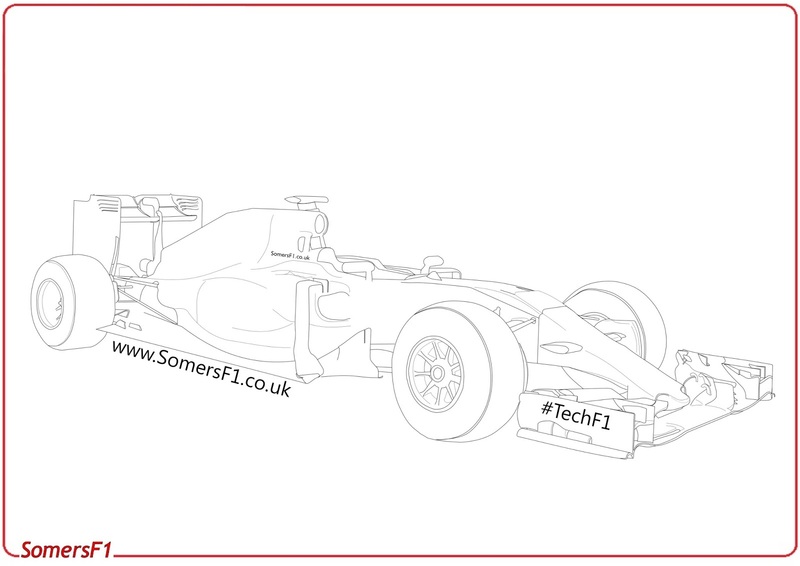 However, for an irreverent look at the development race of 2015 I thought I'd do just that, taking my favourite aspects of the 2015 cars and mashing them into the SomersGP-001. 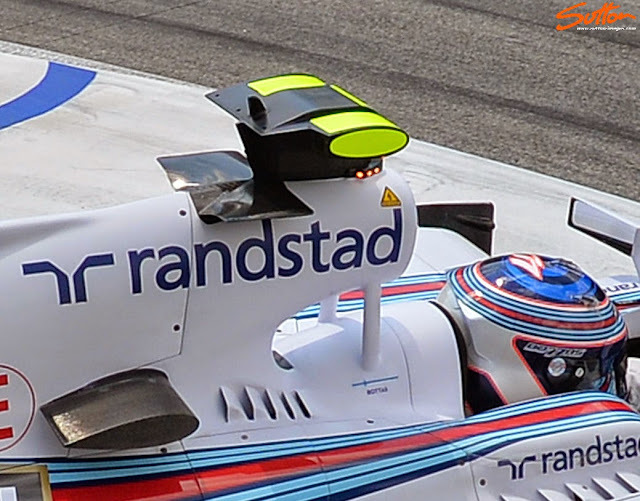 The enlarged 'funnel' was introduced in the team in China, the intent of which was to better manage how airflow moved around the front tyre. For years Red Bull have been the team to beat in terms of their front wing design and whilst 2015 was no different I feel that Mercedes may have skipped ahead of their rival, when they introduced their new philosophy in China. As such, we have seen many teams adopt this more aggressive compartmentalising of the wing during 2015. (Red Bull, Williams etc). Mercedes also went on to develop the 'Sabretooth' serrations on the penultimate flap of their front wing in Japan, enabling them to run a steeper AoA without fear of flow separation. A move that remains uncopied by their rivals thus far but I suspect may be seen on other cars during 2016. The VJM08 nose from behind, marked in green is the outlet for the 'nostrils' which also mean that when you look directly above the nose you cannot see the ground below. Whilst it might not be the prettiest incarnation (although i really like it), the 'Vented Cobra' formed part of Force India's mid season 'B-Spec'. It's an altogether different interpretation of the regulations and just goes to show how you can fit a square peg in a round hole if you try hard enough. Whilst all of the teams (with the exception of Mercedes and Ferrari, amazing how they had the fastest cars though eh?..) 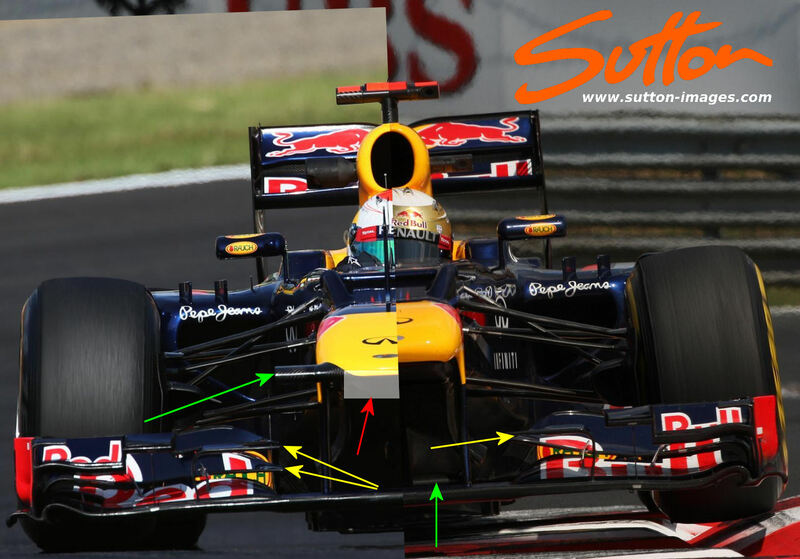 chased development of short stub noses, with protrusions that sat as far back over the front wing neutral section as possible. Force India pursued this avenue, which perhaps won't give the performance figures of the more advanced short noses but, it is less complex, therefore requiring less bulk to pass the crash tests (ie less weight). Meanwhile, the half way house solution not only supplies sufficient airflow under the nose but also deals with how its footprint affects the neutral section below. Here I have to draw on two teams ingenuity. Manor whom were born from the ashes of the Marussia team, essentially ran a 2014 car. The problem with which was the change in the nose regulation, it's actually something that myself and Scarbs sat and talked (amongst other things) about at the last pre-season test over dinner. 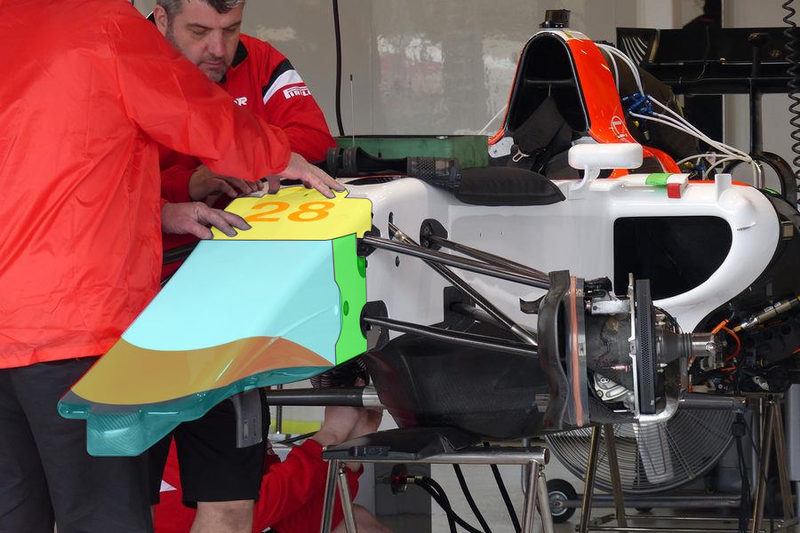 Without the clarity of the regulations to hand and the unfolding news that Manor was coming into being we were both a little unsure how they'd use a 2014 chassis in 2015, given the change in nose regulations. However, as we found out in Melbourne it's all rather easy if you just use a spacer between the two structures. Whilst I laud Manor for their clever interpretation I also have to congratulate McLaren on taking a concept already used by many teams and refining it to suit their own needs. Their twin tubed 'S' duct was an elegant solution that allowed the airflow to exit around the pitot stack, rather than it cause a disturbance. Furthermore, to allow for the internal ducting the team also had to mount the brake cylinders, normally housed on the front of the bulkhead, within the chassis. The wake shed by the front tyre (yellow) is manipulated by the airflow that has passed through the brake duct, hollow axle and then shed into its path (light blue). NB. This image is meant only as an illustration to show how the blown axle concept works and is not wholly accurate. Again, the blown axle is nothing new, albeit it has been altered over the years by the prevailing technical regulations. However, Red Bull used it differently to most during 2015. Whilst the concept was retained throughout the season for the likes of Ferrari and McLaren, Red Bull only applied it at circuits where they needed more downforce. The blown axle is something that cannot simply be bolted onto the car and be expected to work, as it affects many flow structures. 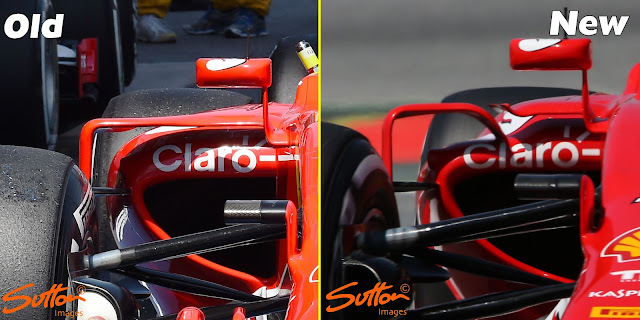 The camera housings used up and down the paddock for decades now are designed to be as aero neutral as possible. However, if used in the right positions they can provide an aero advantage in favour of another component. 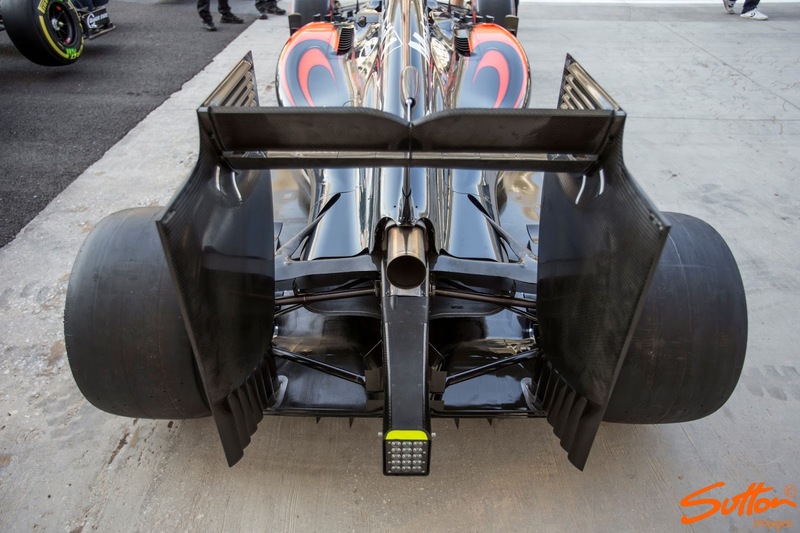 Up until 2014, when the regulations moved the camera housings to the side of the nose, the teams used them in varying positions, mainly to influence the other supposed neutral section: The Y250 central section of the front wing mainplane. Red Bull and McLaren were perhaps the most proficient of users, changing their positions throughout the season based on how much they wanted to influence the mainplane. 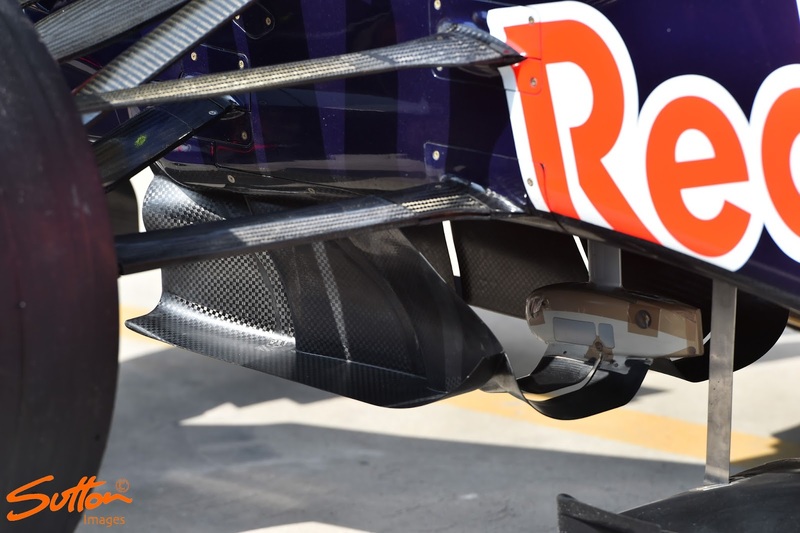 During 2014 Red Bull neutralised their camera mountings entirely placing a peep hole in the transition panel between the chassis and the nose. The FIA ruled this out in 2015 along with an attempt to eradicate the stalk mounted nose appendages the likes of Mercedes used on the W05. What we ended up with was essentially the same, albeit the stalk dimensions were minimised, as the teams wanted to retain the camera mounts in those positions to assist the flow structures downstream. The vanes we find hanging under the nose/chassis of the cars help to control the movement of air under the nose, whilst shielding it and re-using the airflow dispatched by the front tyre. 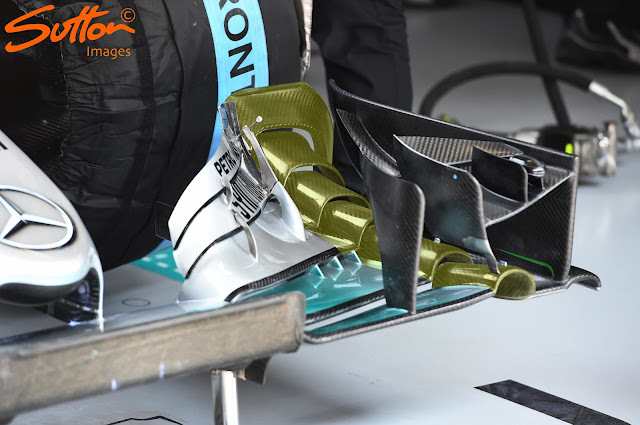 Mercedes introduced a 'Bat-Wing' on the W05 and retained it on the W06, whilst Ferrari's developments led them to use an almost identical appendage. Meanwhile, Red Bull who've always paid particular attention to this area of the car continued to develop their turning vanes, alongside a shorter nose iteration and a 'Gull-Wing'. 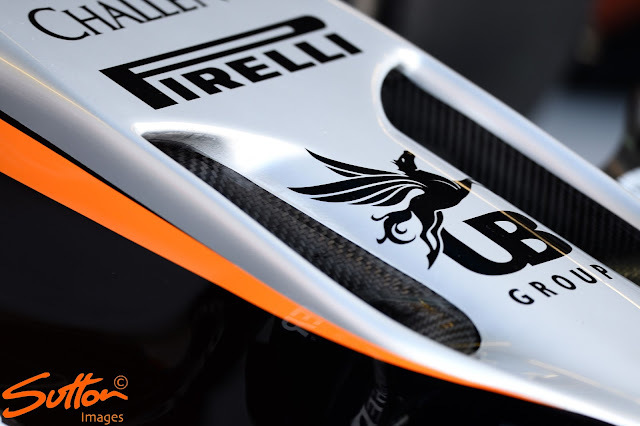 The 'Gull-Wing' works in much the same way that the Mercedes and Ferrari 'Bat-Wing' does but, instead of being sat astride the ride height sensor structurally independent of the turning vanes, it mounts to them. This frames the aero structure in a horizontal sense as well previously just the vertical one. Pre-2014 the teams had less to concern themselves with in terms of packaging whilst in the hybrid era the teams have had to consider how to cool the inlet charge too. 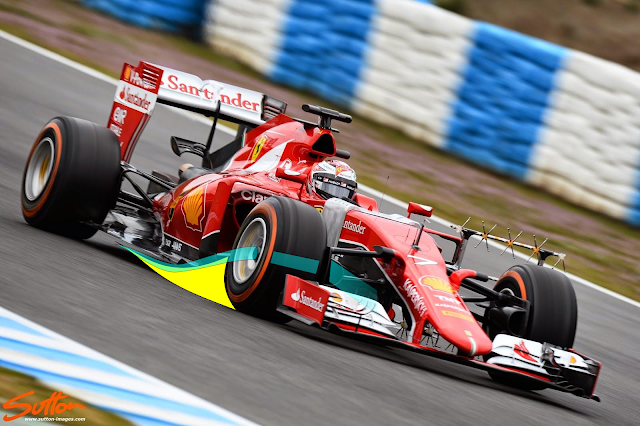 Mercedes works team and the Ferrari powered teams use a liquid-air cooler whilst most of the field use air-to-air coolers, which are usually lighter but require more physical space. These coolers all reject heat which require more or less cooling apertures to disperse the heat at the rear of the car depending on the circuit. 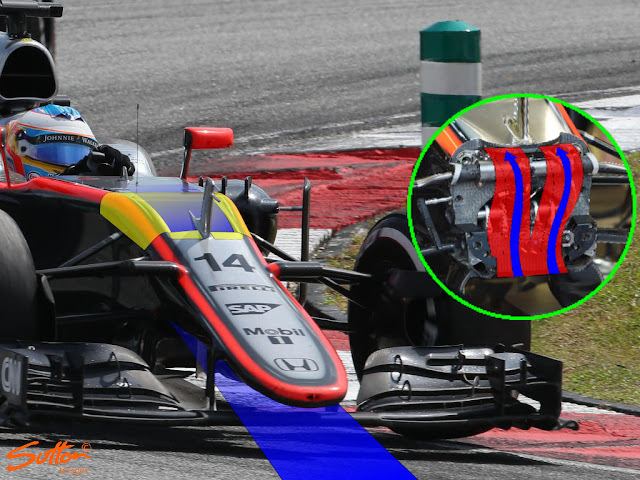 The larger the cooling outlet, the larger the impact it has on the aero of the car, meaning teams often run very borderline, often to the detriment of performance. Ferrari opted to engage a different philosophy for 2015 (above), which allowed them not only to increase the physical size of the coolers within the sidepods but run with the bare minimum in terms of cooling outlets. The cooler (illustrated in blue) sat flatter and cantered inside the sidepod, allowing the outer shape of the sidepod to follow suit. 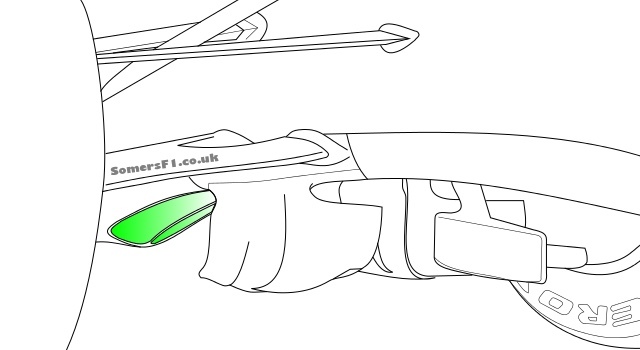 In order to allow airflow to reach the furthest, lowest point of the radiator at the same velocity as the forward most point they utilsed internal winglets (illustrated in green), which traversed the sidepod inlet. On top of the radiator another appendage was used (illustrated in yellow) to funnel the rejected air to the rear of the car. What was particularly impressive about Ferrari's adoption of this layout was that when the team arrived in Barcelona their new aero package consisted of a large chunk of the sidepods shoulder being removed, completely radicalising the look of the SF15-T compared with the rest of the field. 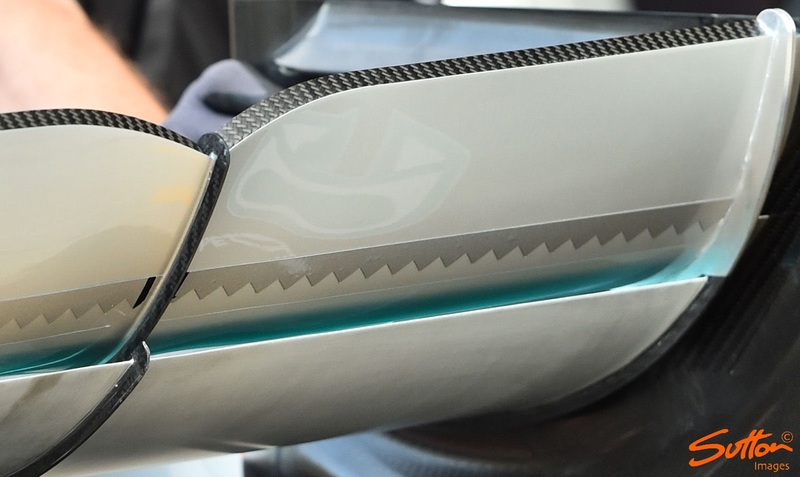 Used by both Ferrari and Williams, the airbox winglet cleans up the airflow ahead of the rear wing improving its efficiency. 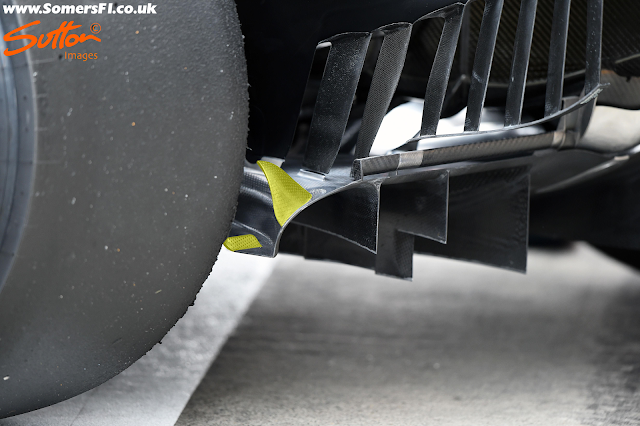 The floor ahead of the rear tyre of a Formula One car has become an ever more complex section over the last few seasons. 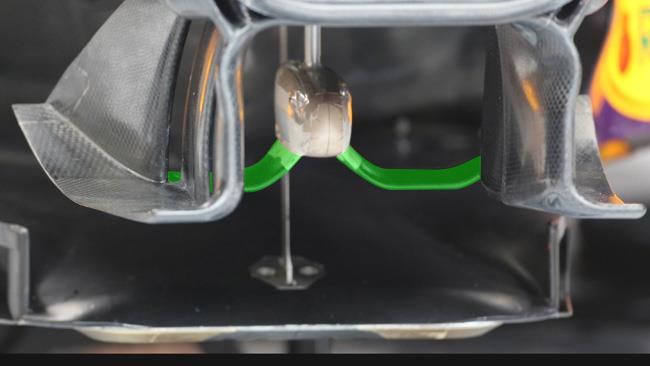 Controlling how airflow spills off the rear tyre into the diffusers path (tyre squirt) is crucial in providing additional downforce, especially in transient conditions. Unable to simply put a hole ahead of the rear tyre (cleared up by the stewards post Monaco 2012) the teams use almost imperceptible slots from the floors edge instead. I have to go with McLaren for this one as the practice of adding slots may have gone a bit nuts over at Woking. Their later design featured 11(!) slots ahead of 2 more dog-legged slots giving your cheese grater a good run for its money. 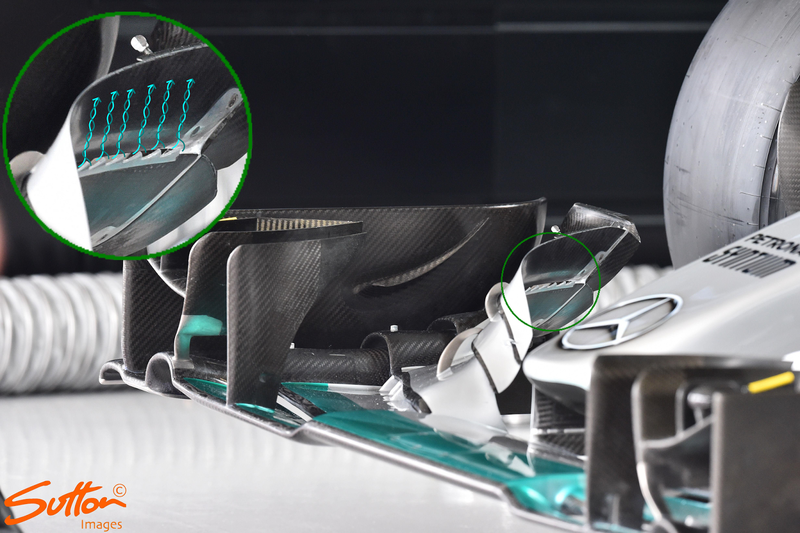 One of the major design coups of 2014 was Mercedes lower front conjoined wishbone, something which was copied by several teams in 2015. 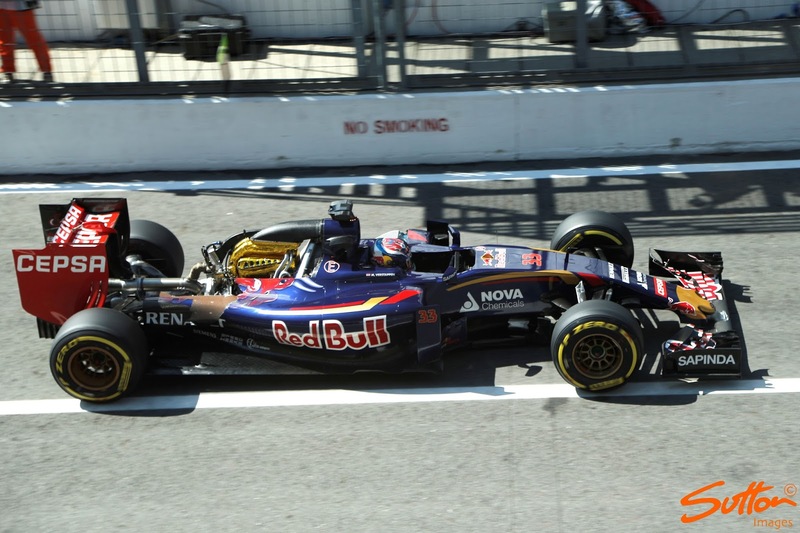 In Austria, Toro Rosso took a similar approach at the rear of the STR10, increasing and reshaping the outboard bulk. 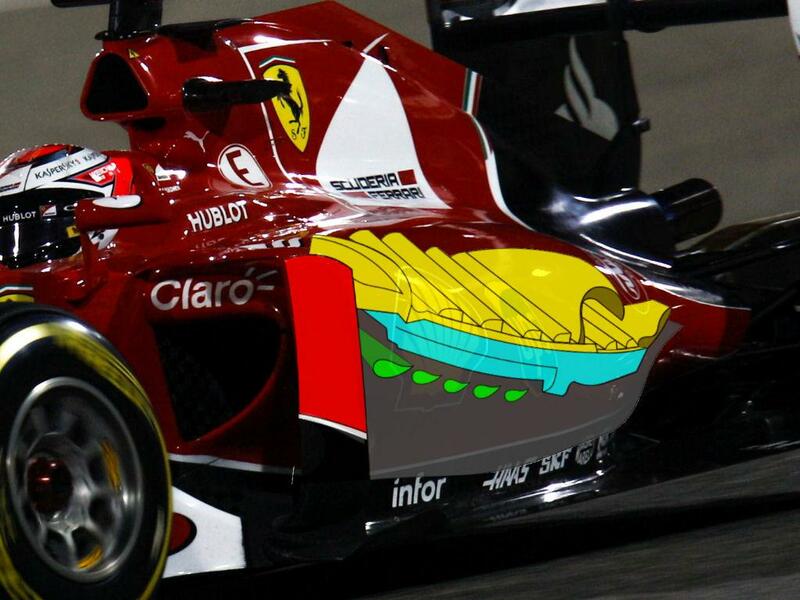 This one has to go to Mercedes, be it their Spa or Monza configuration which utilised a spoon design. 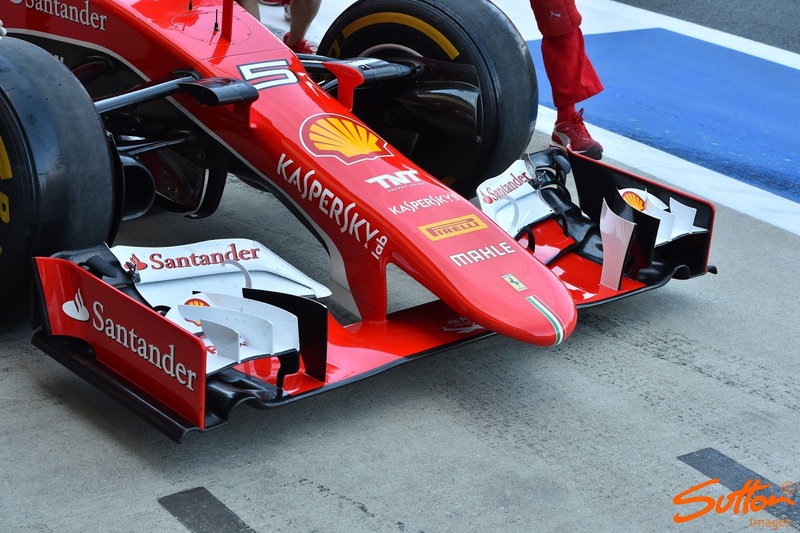 The deeper dished centre section of the rear wing provided the compromise needed between downforce and drag for the circuits demands. 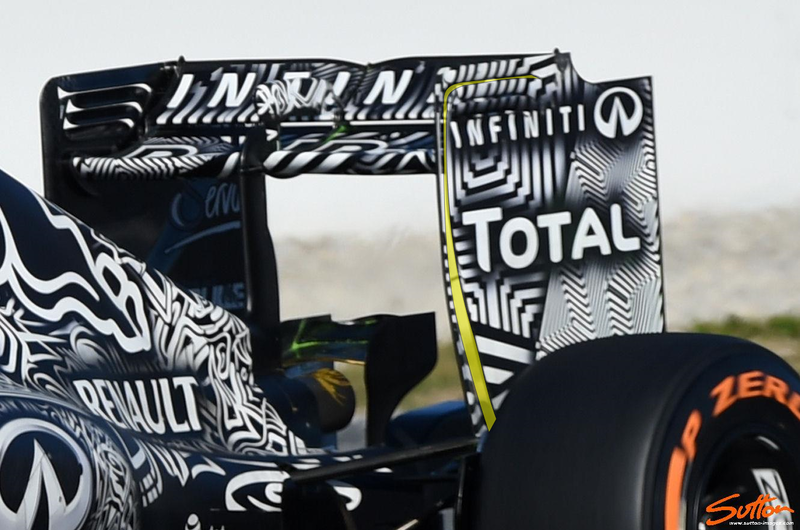 Red Bull's dazzle livery was supposed to hide many of the design details of the RB11 during testing. However, if you know what you're looking for it doesn't really hide too much. Even so, I illustrated the car without the dazzle livery (below) to highlight just how the RB11 really looked. Whilst I love the almost simple but elegant design employed by Mercedes on their swept and serrated endplates, it was the rear wing endplates that Red Bull ran at the final test and more specifically the leading edge slot that intrigued me. Highligted in yellow the slot which are ordinarily much shorter spanned the entire leading edge, conjoining with the upper louvre. These slots redistribute the airflow from the outer surface of the endplate, improving flow across the inner and outer surfaces. The length of the slot used on the Red Bull indicated that the team wanted to envelope the rear wing flaps outer surfaces into these aero structures, as converging them with the louvre would have an effect on how the tip vortex formed. Williams season was a bit hit and miss for me, the FW36 took the fight to Mercedes on some of the high speed circuits by virtue of its low drag, efficient design. However, with the FW37 Williams attempted to load on more downforce, which of course reduced its straight line abilities, with many more structures appearing on the car increasing drag. 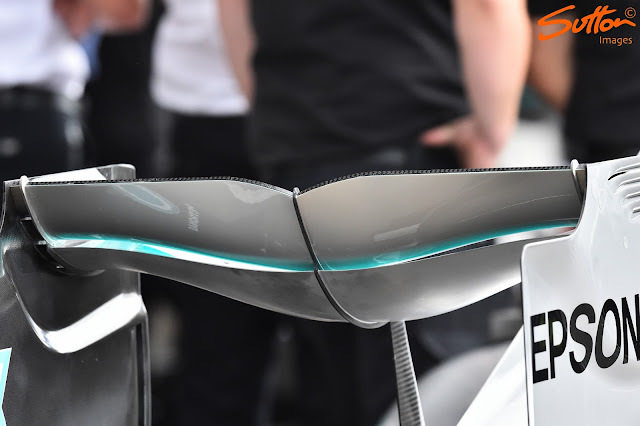 One area of interest to me was their adoption of a pressure gradient fin on the upper, outer surface of the diffuser with their upgrade package in Austria. Much like a gurney flap this will create a steep pressure gradient on the front surface and a low pressure zone in behind. You might note I have not included anything from the Sauber C34 or Lotus E23, both of which were pretty beige cars. Struggling financially those two teams had to focus on overall performance rather than concentrate on the minute details. Excellent work! Actually, I'd love to see SomersGP-001 on the track just to see if it would beat the lot of them. A++ a cracking read! Great article Matt, exactly the sort of thing I come to this site for. And I'm with Ted, ban engine covers. I'd be interested to hear your thoughts on the implications of such an idea.